Mr. Baines joined Lancashire Constabulary in 1976, rising to the rank of Chief Inspector before moving through promotion to Greater Manchester Police (GMP). During his tenure with GMP, Commissioner Baines served in various posts including; Head of Corporate Performance with responsibility for raising standards throughout the force; Divisional Commander for Oldham; and Divisional Commander for Salford. After completing the Strategic Command Course, Commissioner Baines was appointed Assistant Chief Constable in the Cheshire Constabulary, where he held control of Operations Support. Mr. Baines took up the Post of RCIPS Commissioner of Police in 2009. Commissioner Baines holds a Master’s Degree from the University of Cambridge where he studied International Relations. He was appointed as an officer of the Order of the British Empire (OBE) by Her Majesty Queen Elizabeth in January 2014. 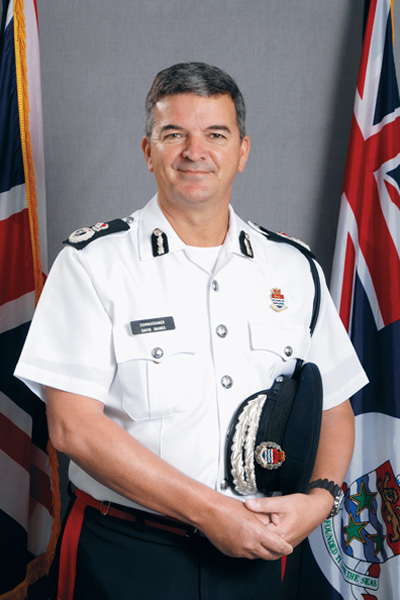 Mr. Baines departed his post effective 31 May 2016 at which time Deputy Commissioner Anthony Ennis became the Acting Commissioner and Chairman.